After watching the U.S. presidential debate the other day, I'm puzzled at what it possibly might be that Bush is doing right. You know, I see a guy who's dazed and confused, seeming to be under the influence of some kind of psychiatric drugs, unable to discuss the issues at hand, but simply able to wake up once in a while and repeat the same two or three points, with some conviction, but without much relevance to the particular questions at hand. And, ok, Kerry isn't particularly charming, but he was prepared for defending his position and the rationale behind it and for presenting some kind of plan. So why is it that a considerable percentage of the U.S. population actually considers Bush a leader who delivers a message they like? Well, I noticed a particular difference, which also might be a typical difference between what's called conservatives (=republicans) and what is called liberals or progressives (=democrats) in the U.S. You know, Kerry was talking about whether the war in Iraq was justified or not, which based on the evidence, it wasn't. But he thinks that it would be a bigger mess not to "finish" it at this point. No matter how clearly he lays that out, it opens him up to being accused on flip-flopping and not being sure what he thinks. And then there's the key point: What message are we sending? 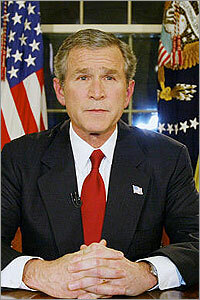 Most of Bush's position added up to "sending a clear message". A message to the world, a message to the U.S. allies, a message to the Iraqi people, a message to the troops in Iraq, a message to the "terrists". It apparently has nothing whatsoever to do with whether that war is backed up with sufficiently good reasons or whether anybody is better off for it or whether sufficient dialogue has taken place. No, the main thing is sending a message. Showing how strong and single-minded we (the U.S.) are. That is clearly contrasted to the other approach, which is to look at the facts, talk about things, and try to take the best possible action. And if the situation or the information changes, then to talk about that, and see what to do next. Now, I'd definitely be leaning towards considering the second approach the "proper" way. Not based on any political opinion, but based on the need for examining what is at stake before taking important decisions. Seems self-evident to me. You need to check with reality first, and hear what everybody involved have to say. Dialogue. Cooperation. Seeking the truth. "Democracy" it is called, as well. Going through some kind of process where everybody involved will have some kind of input into making the best possible decision. So it is with some incredulity that I realize that a whole lot of people don't work like that at all. Rather, they start with the outcome they'd like to see happen, and then they use the means at hand for getting it to happen. Which includes talking about it, repeating it, giving reasons for it, lining up other people who think so, or just going ahead and doing it. And in that camp you score points for not ever wavering from the view you started off with. Staying firm on your conviction is more important than facts, or whether lots of other important stake holders disagree. You'll recognize it with religious convictions, of course. They don't come out of a dialogue that is intended to unearth the facts and the most desirable outcome. On the contrary, it usually starts with some arbitrary statement interpreted from an old book by a revered prophet, and it is believed necessary to get its intention carried out, without being distracted by facts or feelings or different views. I'm not aware of any previous U.S. administration before Bush's that worked predominantly in that way. I.e. they work out in some think tank what their position is and what is supposed to happen, and then they go and do it, and facts and differing opinions make very little difference. But apparently it works because it resonates with something in many people. And I do recognize it always having been there in the "conservative" mindset. Just never before has it been exploited so blatantly and openly. An example would be the issue of abortion. The conservative view would tend to be that it is wrong, for religious or moral reasons. Thus the task becomes to send a strong message that we don't want that, and laws are merely a tool for sending that message. But even most of the conservative politicians who campaign against abortion rights would privately admit that if their own daughter needed an abortion, they would of course help her with that. Bush Sr was caught admitting that once, for example. The point is that in that mindset, such an apparent conflict doesn't change the position. The position is a certain point which one needs to send a message about. It is only a minor issue whether it really would work for everybody, or whether there's agreement about it, or whether one even oneself would want to adhere to it. The difference is clear in the typical liberal vs conservative ways of talking about things. Well, I don't know if it is really just a liberal vs conservative thing. I don't really like or agree with the illusion of a political spectrum. But let's stick with those words for the moment. So, liberal people would tend to want to dig up the facts and talk about them and they tend to want to look for some solution that works for most everybody. Some kind of consensus based on what is on the table. So, obviously one can't preach the outcome in advance, because one doesn't know what it is yet. The answer is "it depends". For conservative people, that seems terribly wishy-washy and ineffective. The thing to do is to have a strong position, based on moral principles and the protection of your own kind, and then you carry your intention through, no matter what. So, you score points for a noble and moral aim, presented clearly and concisively. And for going through whatever it takes to get there. So, the way liberals would want to discuss big issues would be to bring forward various kinds of facts and the concerns of various kinds of stake holders. Say the issue is the war in Iraq, or global warming. Instinctively, this kind of person would believe that if we just bring this all out in the open, sane people would realize the truth and act accordingly. And these folks are really surprised if even the most obvious and horrifying facts don't change public opinion. The conservatives use information very differently. It is not used as input to help people decide what is what. It is used to back up the moral and noble aim that is being carried through, and as part of the message. So, the information that is being provided is to support and strengthen and promote the position we started with. If things aren't going well, the answer is to speak more clearly about the initial position, to create a more clear and focused message, backed up by whatever is available to back it up with. There's a considerable number of right-wing weblogs which seem remarkably well coordinated and synchronized. Common for a lot of them is that their opponents, the left-wing liberals, loudly are regarded simply as "idiots", "morons", or similar words. You see a surprising number of blogs where that's even stated as the head-line or in the blog's name. You know "anti-idiotarian ..." And they go to some length to create "Laugh at Liberals" websites, and that kind of thing. No, I'm not going to link to them. But my point is the different way of having dialogue. The liberal approach of showing concern for different sides is just very funny and ridiculous for people on the other side. Obviously moronic and naive to think one could actually talk with North Korea, or reason with terrorists, hahah. The right-wing blogs also post loads of information about the bad deeds of the bad guys, but again, information selected to back up a position, not information selected to provide the whole picture. I don't see very many left-wing weblogs that spend most of their energy on ridiculing right-wing people. Oh, not that anybody would mind, but it doesn't seem to be the same focus. Which is again that difference. From the conservative perspective, it is of crucial importance to take down the opponent. From the liberal perspective it is of crucial importance to bring everything on the table, to be decided. The first approach often wins, because it is much easier and clear. There are other aspects to the stereotypes of conservative and liberal people, of course. For conservatives, the ideal is a strong father figure who imposes discipline, and discipline and hard work are rewarded. For liberals, the ideal is a nurturing mother figure who listens to everybody's concerns and makes sure there's a warm meal for everybody. For conservatives, the world is a dangerous place and one better protect oneself and one's property against the bad people out there. For liberals, the world is basically a nice place and there needs to be room for all of us in it. Anyway, I still don't believe in the political categories or spectrum. I think it is a fake scheme to cover up the real choices. Anyway, the political groups often end up doing the opposite of what they're supposed to. Like, in the U.S. it is supposed to be the conservatives that are for small government and private freedom, but yet they create the most humongous central government and spend more money than anybody else, and they put way more curbs on personal freedoms, many only for abstract religous reasons. And the supposedly big government liberals end up balancing the budget and to a much higher degree let people do what they feel is right. Anyway, that's all the U.S. picture. Looks different in other parts of the world. Anyway, I didn't actually mean to talk just about politics. My point was the difference between worldviews of those who prefer clear, strong messages and those who prefer to have a dialogue about the facts. I'm afraid there's unfortunately still more of the first kind of people. A few days ago I tried to post a comment. Now I don't even remember it so probably it wasn't worth remembering.